Soak the beans for 12 hours. Wash them well and place them in a deep saucepan. Boil them for 20 minutes. Chop the onion, the carrots and the celery, mash the tomatoes and add all of them in the saucepan. Add olive oil (as much as desired), salt and pepper. Stir the mixture and add plenty of water. 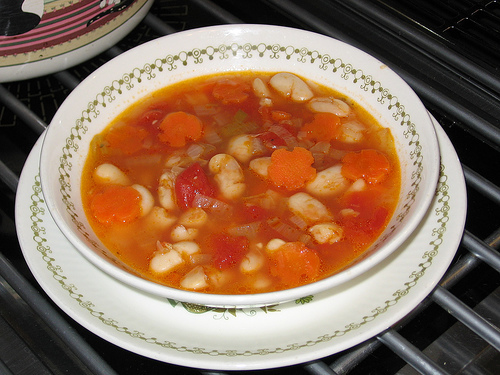 Boil the soup in low temperature until the beans are tender . Bean soup is served with smoked herring and olives and is well known in Greece as a very nutritious meal.